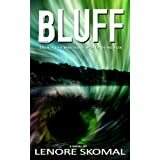 This is the first, in what I hope to be many of Lenore Skomal’s books i will read. Having had this book in my library for a few weeks now, I just didn’t think an amazing book lay between the unassuming cover and (at the time) nondescript title. I started reading this book late at night and was spellbound within the first few paragraphs. The book tells the story of Jude, a sufferer of depression, who was raised by a single parent alcoholic mother. Jude has an estranged older sister April, but she is essentially a loner, and very misunderstood. The story also develops into many other characters, including Francis, Jude’s only real friend and an ICU Nurse who Jude knew before the incident, but in whose care she now finds herself in. Each one of many characters are woven intricately into the life of Jude in strange and sometimes surprising ways. The title is so fitting, because she lives on the bluff, but you only see the double meaning once all the characters develop and show their true colors, much like in real life. When meeting new people showing our first impressions we all bluff our way into the fantasy we want others to believe our life is like. Such a clever title!